As I write my second entry as an intern of the Burke Library, I am struck by the great contrast between this day and my first day in January. In time for a number of faiths’ holidays, New York has at long last emerged from a long winter and spring has arrived. And, thanks to this internship, I can finally say that I have processed some archival collections! Most recently, I completed work on the papers of Thomas Samuel Hastings (1827-1911), who served Union Theological Seminary as a professor and president for many years following a long career as a pastor, primarily at West Presbyterian Church in Manhattan. Working with these papers was brilliant exposure to the kinds of materials prevalent in late-19th-century and early-20th-century archives, such as handwritten and typed correspondence, diaries, scrapbooks, and photographs and allowed me to practice a wide range of basic preservation techniques while handling and re-housing the collection. The intellectual content was also absorbing, as the collection contains significant correspondence with John C. Brown, a banker and long-time member of the seminary’s board of directors, that touches upon the Charles Briggs affair. As president of Union Theological Seminary, Hastings was intimately involved in defining the seminary’s position within the larger theological debate then occurring regarding revision of the Westminster Confession and marshaling support for Briggs during his trial for heresy (described in greater detail by Ruth Tonkiss Cameron in a blog entry last month). 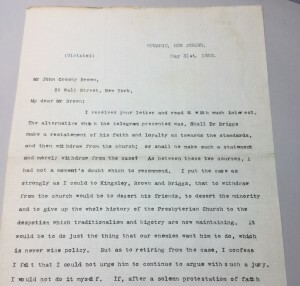 Researchers interested in that particular moment in history will find rich material for review, such as the May 31, 1893 letter to Crosby in which Hastings’ strong feelings with respect to whether Briggs should withdraw from the church or merely from the heresy case are conveyed. Hastings avers that “to withdraw from the church would be to desert his [Briggs’] friends, to desert the minority and to give up the whole history of the Presbyterian Church to the despotism which traditionalism and bigotry are now maintaining” . While this excerpt from Hastings’ private correspondence could enrich one’s understanding of an epochal moment in American Presbyterian history, the seminary’s ultimate support of Briggs and his faculty status is well known and related in published sources. One of the special aspects of accessing archival materials, however, is that it enables one to try to shift the vantage point from which one seeks to view past events: to be not just a consumer of an official, third-party history, statements prepared for posterity, or later reminiscences of a participant. ­Viewing this letter within the context of the Thomas Samuel Hastings Papers, one can compare and contrast it with other letters to Crosby regarding board matters and try to develop a sense of the weight that various actions and opinions were given by participants at the time. Working with this particular collection has also given me an appreciation for the value to researchers of the existence of institutional collections like Union Theological Seminary’s archives, as I am beginning to see how individual archives, such as those of Charles Briggs, Thomas Samuel Hastings, and Williams Adams Brown, to name just a few, that arise from the same affiliation can “speak” to each other and form a more complete picture of past events. I have been enjoying interning at the Burke Library immensely and I am glad that some time remains before the end of the semester. I look forward to continuing to learn something new each week at the library and am hopeful that I can process several more collections over the next month. Letter to John C. Brown, UTS 1: Thomas Samuel Hastings Papers, series 1, box 1, and folder 4, The Burke Library Archives, Columbia University Libraries, at Union Theological Seminary, New York. This entry was posted in Archives, Collections, History, Student Entry and tagged Archives, Burke Archives, interns, Processing on April 10, 2015 by Katherine Palm. Katherine Palm is in her second semester at the Pratt Institute of Library and Information Science where she anticipates earning an MSLIS with an advanced certificate in archives in May 2016. In addition to her studies and internship at the Burke, Katherine works part-time in the New York Public Library's Lionel Pincus and Princess Firyal Map Division, where she enjoys helping provide access across the division's large holdings of maps, atlases, and related books to researchers and visitors, as well as the daily opportunities to learn something new about a time and space in history.